The sacroiliac joint is formed at the borders of the sacrum and the hip (pelvic) bones – the iliac crests. This is a long vertical joint, about the length of the side of your hand. This joint is held together by multiple ligaments, with many nerve pain fibers contained in these ligaments. The sacrum is at the base of the spine and is subject to a great deal of stress. When the sacroiliac joint becomes inflamed a condition known as Sacroiliitis develops. Sacroiliitis can be caused by heavy lifting, straining your back or trauma, such as falling. The pain is quite unique but can mimic low back pain or sciatica. One has to be looking for Sacroiliitis as the incorrect diagnosis of sciatica can be made. Patients do not understand why they have leg pain and yet normal MRI lumbar spine scans and EMG studies. The pain is coming from inflammation of the pain structures within the joint itself. Diagnosis is made by a careful history and complete neurological exam. 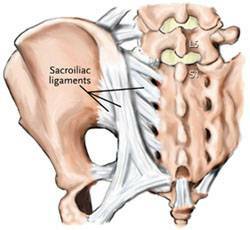 Patients with Sacroiliitis can be diagnosed by having a normal neurological exam with an abnormal musculoskeletal exam. Palpation over the sacroiliac joint almost always reproduces the patient’s pain exactly. The neurological exam fails to show any evidence of nerve root compression, “pinched nerve.” The sacroiliac joint is frequently inflamed on both sides, perhaps fifty percent of the time. Typical symptoms include pain and stiffness in the lower back, frequently worse on getting out of bed in the morning. Walking exacerbates the pain. The pain can radiate into the hip, lower back or down the back of the leg. A limping gait is not uncommon. With a normal neurological exam, diagnostic studies are frequently not needed. Treatment consists of various ways of relieving inflammation. Anti-inflammatory agents can be helpful in some cases. Physical therapy can help relieve the lower back and buttocks spasm that can be associated with Sacroiliitis. Many cases are severe enough to require and cortisone nerve block. In our practice, Sarasota Neurology, this nerve block is effective about 80% of the time. In patients who has persistent sacroiliitis pain, platelet rich plasma (PRP) is ideal therapy. PRP is injected directly into the sacroiliac joint. The graft adheres to the injured tissues inside the joint. The standard response of inflammation, proliferation and remodeling occur over a 6 week period, usually with excellent results and pain relief. Long lasting pain relief can be expected. This treatment is very safe with an extraordinarily low complication rate. Ask your doctor if you may be a candidate for PRP therapy.